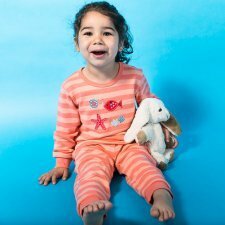 Children's pajama of a fine, very soft, resistant and medium-weight organic cotton. Model with cuffs on the sleeves and ankles, elastic waistband and cheerful print on the shirt. Sizes from 1 to 5 years of age. The short boys' pyjamas gently accompany little late risers through mild nights. The shirt comes with trendy print on water-soluble basis, the shorts are plain and have a drawstring in the waistband with contrasting string for comfortable width adjustment. For boys and girls – basic pyjamas from 100 % organic cotton (180 g/m2) in a soft and skin-friendly fine rib all-season quality. Cuffs at the neck, arm and leg with cotton-covered elastane (no direct physical contact) for a lasting fit. Colour: shirt white/light grey striped and pants in light grey. Short Pyjamas in 100% fairtrade organic cotton making it so soft and comfortable to sleep in. 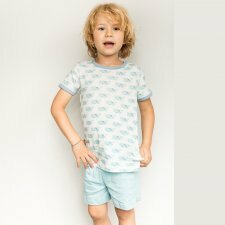 The pyjamas comes in a fun all over whale print shirt with a blue solid short. Our popular classic: interlock jersey pyjamas made of 100% organic cotton. Yarn-dyed stripes. The Pyjama Nicky is optimal for the whole season. The supple interlock fabric on the sleeves and the soft Nicky material for top and pants ensure a comfortable fit. Two snap fasteners on the side of the neck allow an easy dressing. The soft, elastic waistband on the belly of the pyjama pants ensures optimum grip. 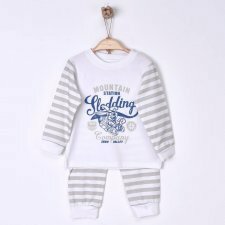 A special feature are the upturned cuffs and trouser legs, which makes the pyjamas grow with the child and also ensure that nothing slips when sleeping. The snap fasteners are nickel-free. Colour: shirt blue or light pink, trousers grey. The pajama 1/1 Boys is ideal for the whole season. The certified ribbed material ensures a comfortable fit. Two side-mounted snaps on the neck make it easier to put on and take off. The pulled-in pants rubber on the belly ensures an optimal hold. An extra wide elastic waistband on the leg and on the sleeves gives optimal grip. Warm and soft sleeping overall made of 100% organic cotton fleece.